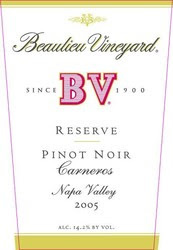 The 2005 BV Reserve Pinot Noir is a Napa Valley Pinot that is sourced from the Carneros AVA. Beaulieu Vineyard owns 350 acres in the region and sources the fruit to make this Pinot from three estate vineyards in the appellation. The wine is aged in mostly French oak barrels, but I'm not entirely sure of the percentages and lengths of time. On the nose I get very classic Pinot Noir aromas of cherry and strawberry rhubarb. I love the meatiness of this bouquet. It almost reminds me of fruit paste or fruit glazed meats. There is also a nice mineral and wet stone component along with a touch of spice and cedar. When the wine develops in the glass there is also a noticeable plum-like characteristic. The flavors are quiet rich and concentrated with cherry fruit taking center stage, and a secondary strawberry rhubarb pie complex towards the finish. I also notice a floral like aroma/flavor as I draw air on the wine in my mouth. The mineral component is also a flavor complexity that is quite noticeable and displays a unique sense of place and vineyard designation. It's a bit warm on the finish which bothers me but doesn't necessarily destroy my overall impression of the wine. Cool! I love Pinot Noir! There is nothing like the taste, I can't even describe it. It's my favorite!